Apply your cashback as soon as you accumulate $25. You can even access your cashback on the go from any tablet or mobile device! 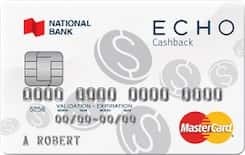 This CAD currency 36 is issued by National Bank and runs on the MasterCard Network. The purchase interest rate for this credit card is: 19.99 percent annually and the transfer balance interest rate is: 22.99% per year. Also the cash advance rate is: 22.99% per year. Travel cancelation is Not available for this credit card and also travel accidents are Not available.